The Goshen College Faculty Trio performed last weekend to a large, enthusiastic audience. Despite winter weather, Rieth Recital Hall was packed with students and community members for the concert. 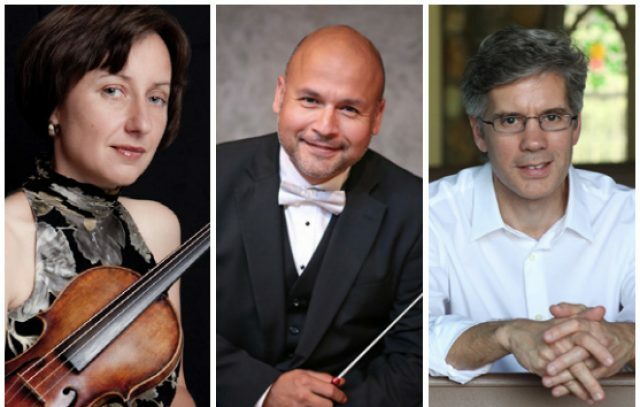 The faculty trio is comprised of Jose Rocha, Matthew Hill and Solomia Soroka, all professors of music. Rocha conducts the Goshen College Symphony Orchestra and Wind Symphony on top of teaching applied cello and music education classes. Hill, chair of the music department, teaches applied piano, music theory, piano pedagogy and chamber music courses. Soroka teaches applied violin, music theory and chamber music. Hill said that it is important for professors to perform because it helps to put themselves in the shoes of their students and understand what their students go through when they perform. It helps the students to attend live performances as well. “Students learn more from those live performances than they do from a lesson,” Hill said. Emmy Rupp, a sophomore music minor, went to the concert and said that it was a great experience to see her professors perform. She had class with Soroka and Hill and had learned a lot about music from them. She noted it was enriching to see the lessons that they had taught being applied in a performance setting. The trio are hoping to play together more often and become recognized, not just as professors, but also as a trio-in-residence of Goshen College. According to Rocha, it is very rare for a college of Goshen’s size to have such talented faculty in their music program and it would benefit Goshen for the faculty to get more opportunities to display their skills. By showing other colleges what Goshen has to offer, it would improve the musical reputation and recruit new music students to the college. As the faculty prepare to expand their horizons as a trio, they have also been discussing a new name. It’s not final yet, and still up for discussion, but according to Soroka, they are leaning towards naming themselves the Sherer Trio, after former Goshen College music professors Kathryn and Lon Sherer, who are still remembered today for the way they dedicated their lives to nurturing Goshen’s music students and uplifting the musical life in the Goshen area. The trio played two pieces last weekend, “Dumky” by Anton Dvorak and “Trio I” by Felix Mendelssohn, as well as an encore at the end of “Otono Porteno (Autumn)” by Astor Piazzolla. “Dumky” means “thoughts.” This is an apt title because the piece fluxuates between moods and changes tempo, echoing one’s perhaps distracted thoughts. Prior to this piece, Soroka had never played the selection before, but she was a fan of Dvorak’s music and had even personally met his grandson. The Mendelssohn trio was Soroka’s favorite piece to play. She became very familiar with it when she played it several times on a tour of New Zealand with the popular hungarian pianist Jeno Jando and Hungarian cellist Gyorgy Eder. The faculty performed piano trio pieces made for a pianist, a cellist and a violinist. In a trio, there are no solos or accompaniment. It is important to have partners you can trust.